It’s RRRoll Up the Rim time again in Canada. When we think of Canada we think of many things – humble and kind people, Rocky Mountains, Hockey, and of course, Tim Hortons coffee. 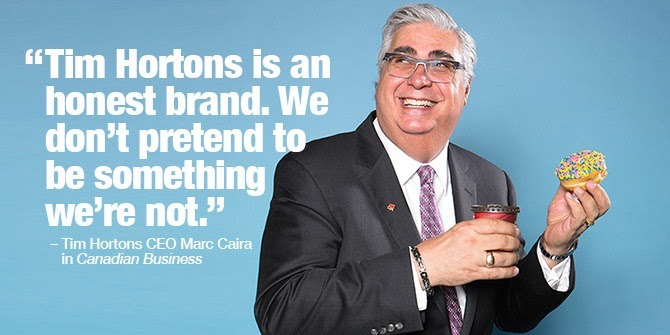 A couple of years ago, I was fortunate to have heard Marc Caira, CEO of Tim Hortons, speak. I was astounded to hear of their business success. They were celebrating their 50th anniversary that year. While you read this, likely 400,000 Canadians have ordered their double double this morning. In fact, on average 1 million Canadians visit a Tim Hortons every single day. 8 out of 10 coffees served in Canada are served by Tim Hortons. They serve more coffee than a their next 15 competitors combined. 3500 stores across Canada equals one Tim Hortons store for every 8566 Canadians. What keeps Marc up at night? “Complacency is our greatest danger, relying on our past successes and the position that we have in the marketplace.” He also shared that like many Canadians, he finds it is easy to be too humble or cautious – not toot our own horn or take necessary risks. He shared that this is both an exciting time and a challenging time with such a great brand, yet the market is in low growth mode and nervous consumers are looking for consistency as well as great value. What is the solution to Marc’s and his franchisee’s danger of complacency? What’s the solution to your career and leadership complacency? The next time you grab a double-double, book 10 minutes alone to think about how you make bold, different, and daring choices to help you reach your potential. To join the conversation, visit us on Facebook, LinkedIn, and Twitter. We’d love to hear your thoughts! P.S. Looking to find the right next move for you? Who is your career coach? We have a team of experts waiting to assist you on your journey. Click here to start the conversation on how you can take control over your future or call 1-877-256-2569 ext 4. P.P.S. Are you an employer looking to nurture your team to become more productive and engaged? CareerJoy has provided services to over 500 corporate clients nationally – will your organization be our next success story? Connect with Lee Grant, VP Corporate, at 1-877-256-2569 ext 400 to learn how we can help.